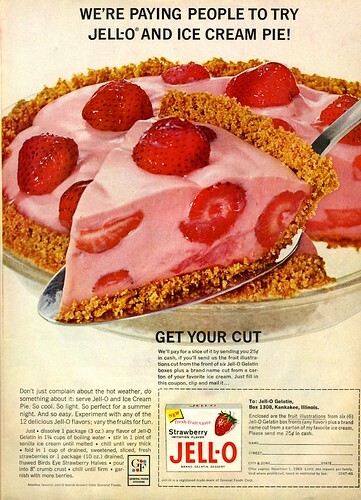 Reading through a gelatin cookbook (something published by either Jell-O or Knox, usually) is an exercise in controlling nausea. These are the people that brought you such brilliant innovations as Frankfurters in Goo, or Pie Plate Salad — not known for good taste. I was feeling rather over-berried today — strawberries have been on sale in supermarkets, the local health food store, and the farmers market, plus Daughter went on a field trip to a local strawberry patch and brought a load home. Since I had peach-flavored Jell-O on hand, I made a peach version of this instead. Just like Pie Plate Salad, this is a “dump and mix” recipe. Simple to do. Looks delish, I’d eat that! Obviously, of course, you should use a homemade graham cracker crumb crust. hi! I found this while looking into doing my own retro attempt. great job! this post was a lot of fun! My mother made this dessert for us every holiday and especially in the summer! Fresh berries are always the best but works with both. I am 55 years old and now make it for my grandkids and they love it! Try it and you won’t be disappointed. It’s so easy to make.